NASA astronaut Scott Kelly discusses his yearlong mission to the International Space Station on May 6, 2015. NASA astronaut Scott Kelly says he's settling into his epic yearlong mission to the International Space Station, thanks in small part to the orbiting lab's new coffee machine. Kelly and Russian cosmonaut Mikhail Kornienko began the first-ever one-year mission aboard the space station on March 27. Kelly said life away from Earth can be a challenge, but he and the station's other five crewmembers are getting along well. "There's no running water," Kelly told NBC's "Today Show" in a video interview on May 6, "and there's a lot of work to do; you're always at work. But there are little things that make things more normal, like the espresso machine." Because ISSpresso — a joint project of the Italian Space Agency and the companies Argotec and Lavezza — is a technology demonstration, "we only have 15 espresso capsules, so we are rationing those," Kelly said, adding that he has tasted the wares. "Works great, tasting great." Kelly was interviewed along with his identical twin brother, Mark, himself a former NASA astronaut. The Kellys are participating in several studies to see how long-duration spaceflight affects the human body. The Kelly brothers provide researchers with unique opportunities in this respect — to look for spaceflight-induced alterations to genetic code, for example. "If one day we want to go to Mars or some other destination in the solar system, we know what the engineering is to do that, but we don't know a lot about the human body," Mark Kelly said during the video interview. Despite such uncertainties, Scott Kelly said he would be enthusiastic about exploring a planet in another solar system that looks like Earth, to "see what's really there, if there are living creatures." The space station is scheduled to get some major upgrades in the next year as NASA prepares it for commercial crew vehicles that should start arriving in 2017. Right now, all astronauts are ferried to and from the orbiting lab using Russian Soyuz spacecraft that launch out of Kazakhstan. 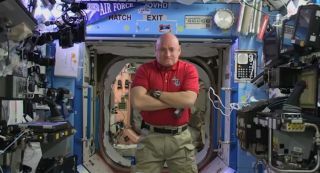 "We're going to start moving one of the modules around and kind of reconfigure or reassemble," said Scott Kelly, who also lived on the orbiting lab from October 2010 through March 2011. Even in orbit, Scott Kelly — like Mark a former Navy pilot — couldn't get away from the teasing from his twin. Mark Kelly pointed out an Air Force banner in the background of the camera view. "You need a Navy sign," Mark said. Moments later, Scott silently floated over and took the banner down.